My view on the current (silly) Scottish Independence debate. I have a problem with politicians, and it’s the same problem I have with deeply religious people or those with any long-standing beliefs. Anyone who has been absolutely certain of anything for a long time cannot be trusted. If you can believe in anything unwaveringly for decades, whether it’s a political party, your god of choice, that women should (or shouldn’t) wear burkas, or that homosexuality is (or isn’t) evil, your opinion is irrelevant. The most useless people in any debate are the hardliners on both sides. Put another way, the more strongly you believe that you are right, the less I believe you. Politicians cherry pick information that supports their existing cause, and ignore or try to discredit anything that might give credence to an opponent. We know this, but we listen to them anyway hoping for a convincing, balanced and well thought out argument that might persuade us. It never appears. I don’t have a telly, and my radio is not used for current affairs, so my main exposure to the debate is Facebook posts. They tend to be rigidly polarised, most often one side pointing out some error the other side has made and poking fun. I have yet to see either side show any respect or give any credit to the other. I hate that. They keep telling us it’s the most important decision in Scotland’s recent history. It’s not. No matter what happens next month, in ten years time most Scots will be living where they would have been, doing the same job for the same salary and paying a similar level of tax for a similar level of public service. And complaining about it no doubt. The Yes campaign keeps bringing up the failings of the Westminster government: dishonesty, corruption and unpopular policies. These are spurious arguments if we examine them singly. The dishonesty I’ve already covered: any member or strong supporter of a political party or cause is inherently untrustworthy. Scottish politicians are no better. The corruption thing is nothing to do with Westminster. Abuse of power happens everywhere, from Putin’s Russia to Troon Community Council. We need stringent laws and good policing but it’s probably impossible to eradicate from a democratic system. Unpopular policies are once again part of the nature of democracy. Our elected representatives will make decisions you don’t like, or I don’t like. If those decisions displease the majority of the electorate, said representatives don’t survive the next election. The scale of government is not important. The current coalition government in the UK is not what I voted for and I have disagreed with some of their policies: others I have fully supported. The same will be true of a Scottish government, and no matter how local the government becomes it will still be true. If three friends have a vote on which pub to go to on a Friday, chances are one of them will be disappointed. The other options are for one person to make decisions on everyone’s behalf, or for each friend to go alone to their own choice of pub. In the short term, independence will impact negatively on all our pockets – it’s probably cost us already. International investors hate uncertainty and almost certainly there have been board meetings in which overseas companies have chosen not to base their new European operation in Scotland, because anything could happen in the next year or two. In the long term I think the difference to the Scots people will be negligible. The Yes campaign’s other main argument is purely jingoistic, and I despise them for that more than anything. Don’t you dare tell me that I’m any less Scottish than you, or that I love my country less than you, or that I care less about children and potential grandchildren that you do. My feelings about those things are my own business, but nationalism is dangerous because of the implied exclusivity of the word. The thing is, I care equally about friends and family in England, and Wales, and Ireland. I also care about the rest of Europe, and about people in trouble all round the world. Quite a lot of the trouble they’re in is down to petty parochial arguments about what city the taxes should be administered in, or what religion the administrators should be. It’s all shite and I hate it. I have more to say, but this could turn into a rant and take me all night. AND I HAVE MORE IMPORTANT THINGS TO DO. There are books to read, songs to sing, beauty to be photographed, art to be appreciated. You know, those things that make us human. Please give me peace from all this independence nonsense. I found this on my old Myspace page, from when I used to put blogs up there. If I were to write it now my language may be less aggressive, but it’s fair to say that my attitude to smoking hasn’t softened in the intervening years. I heard a programme on the radio today – very intelligent and articulate people talking heatedly about the erosion of civil liberties in our “nanny state”, how the government takes a patronising and condescending view of the public and how we no longer trust the public to make their own decisions. They pointed to emotive use of crying children by a graveside in a TV ad, horrific visual imagery of damaged body parts designed to shock, and the way the government talks down to us and tries to manipulate us. All very laudable sentiments apparently promoting freedom of expression and individual responsibility, except that they were only talking about SMOKING!! Smoking is bad. You already know this, because anyone who doesn’t is probably a deaf-mute hermit who doesn’t own a telly or radio, can’t read and hasn’t held a conversation with an intelligent human being since the 1940’s. Trying to persuade people not to smoke is one of the most valid uses of public money I can think of, and smokers are CRAP at giving up just because they know they should. Apparently knowing it’s going to kill you, and that your last couple of decades will be much less fun, and that you’ll get much less sympathy when you get ill because frankly we’re all fed up with your deluded self-pitying whinging, is not enough. You’re committing slow suicide and we would rather you didn’t. If images of orphaned children, slices of blackened lung, and bullying, haranguing and making you feel like a leper are effective in making you stop smoking, then they are justified. WE ARE TALKING ABOUT SAVING LIVES HERE, so worrying about whether we are exploiting children or that we may shock some sensitive old dears is like complaining that ambulances are too noisy. This is about as sensible as “I know! I’ll saw off my left leg!” which in fact would probably be less painful in the long run. (Sorry…) We have the right to talk down to you as if you were a small child or suffering from some mental condition, and to take any steps necessary to make you stop, just like we have a right and even a responsibility to stop a child in the street from repeatedly hitting himself on the head with a hammer. We don’t need to justify our stance or prove that you need guidance, because we just watched you doing probably the STUPIDEST THING YOU CAN POSSIBLY DO. IF YOU HATE YOURSELF AND WANT TO DIE, THERE ARE QUICKER AND LESS PAINFUL WAYS. IF YOU SMOKE IT’S BECAUSE YOU ARE STUPID. ACCEPT IT, FIX IT AND MOVE ON. It was the wood-burning stove in my living room that got me thinking about this. It’s a small black cast iron box with a glass front and you burn logs in it. People ooh and ah when they see it, and think of it as an extravagance on my part. It’s true that it’s not necessary – I’ve got central heating – but it’s really nice on those cold winter nights to see the flames dance, smell the woodsmoke and feel the heat. Yet, not long ago, everyone had either open fires or stoves – my Granny had a range in her Glasgow council flat in the 1950s. Central heating is better: cleaner, less hassle and warmer. The fire, once essential, has become a luxury for the privileged. Electric light is great – we can work and play and read into the night and it’s so easy to switch on and off. So why is it that everyone I visit these days has candles lit? Candles don’t replace the light bulbs – they’re only there for atmosphere. Again, a once-essential item has become a luxury. There are several more examples: riding horses, travelling by ship, even having a bath are less convenient than the modern equivalents – cars, showers and aeroplanes. But people love them, and they’re seen as demonstrations of wealth. The ultimate in poshness these days is probably sitting in a cast iron bath by candlelight in front of a roaring fire, having just come from a day’s riding and about to pack for your ocean cruise. Yet all of these things are all from the past. The next thing that may be relegated to the same status of luxury item for the wealthy might be the book. I have lots of books in my house – three big bookcases just in the living room and a few more dotted round the house, and although I’ve read most of them I mainly like them for some more subtle reason. There is something comforting in being surrounded by things that have value and nobility. Individual books might not survive the centuries but the work will; my life seems transient by comparison. It adds to the atmosphere of my old Victorian house – that too will still be here when I’m dust. But the quickest and easiest way to read a book now is on a Kindle or similar device. My pal might tell me in the pub that the new book by Blah DeBlahblah is brilliant and I can be reading it that night on the way home on the train if it takes my fancy. People like such simplicity and convenience, so I see a future in which the ebook is the norm, and a bookcase is less a repository for knowledge and more a display of social standing. And I’m ambivalent about the whole idea – who’s to say whether it’s a good thing for books to be cheaper and easier to get in a virtual form? – surely it’s the words that are important and not the medium. Yet my emotional attachment to bound pages remains. Children in Horror Films or They only LOOK human. There are many more, and if you look through the whole history of horror movies the list gets huge and includes some of the scariest and most successful films in the genre. It got me thinking, and here are my conclusions. People interact with each other every day, and generally we know what’s going on. We speak to each other, but also read subtle changes in posture, facial expression or tone of voice. This works because adult human beings tend to be similar in fundamental ways. We don’t have identical problems, but we understand and, most importantly, empathise with others, and assume the empathy is mutual. Some of our major horror tropes rely on a breakdown of this mutual understanding – something that looks human but lacks that connection with the rest of humanity is a monster. I’m talking werewolves, vampires, psychopaths, zombies etc. A more extreme version is the alien thing, a creature so radically different from us as to be beyond understanding, so that we can only see each other as enemy, or prey. Movies like Alien, Terminator, Final Destination and all the big bug movies work on this principle. Look into the eyes of Giger’s creature, or those of a giant spider, and you know that it doesn’t care about you. It doesn’t care if you suffer or die, because there is no room for empathy. Now keep that in mind and think of a child of six or seven. The face, the hair, the general layout, are all human – it looks just like you only cuter. But look in the eyes and what you won’t see is that empathy that makes true human connection possible. It doesn’t understand you and it doesn’t care, and you have no idea what’s happening in that tiny skull. Parents think they know their children, but that’s an illusion. Kids cling to us for protection, comfort, warmth, or food, but only in the same way as cats do. And our overwhelming instinct to protect and nurture skews our perception of what they’re really like. Human brains tend to anthropomorphise: we attribute human characteristics to animals, machines, even forces of nature. We might understand on an intellectual level that the rain hasn’t chosen to start right now and ruin our day because Auntie Weather thinks it’s funny, but we can’t help thinking it. We do the same with children – we might call this phenomenon adultomorphism. We see faces that look like ours and we think they’re human, but we can no more understand those small and utterly selfish creatures we can a cockroach, or a moonbeam. Deep down, we know all this. We fear children in a profound way, partly because of the lack of true understanding, partly because we know we are looking at our replacements. Yet we are tied to them by an inescapable emotional reaction that makes it almost impossible to run away and abandon them to their fate. Possibly the worst thing is that if they do turn out to be monsters it will be our fault. 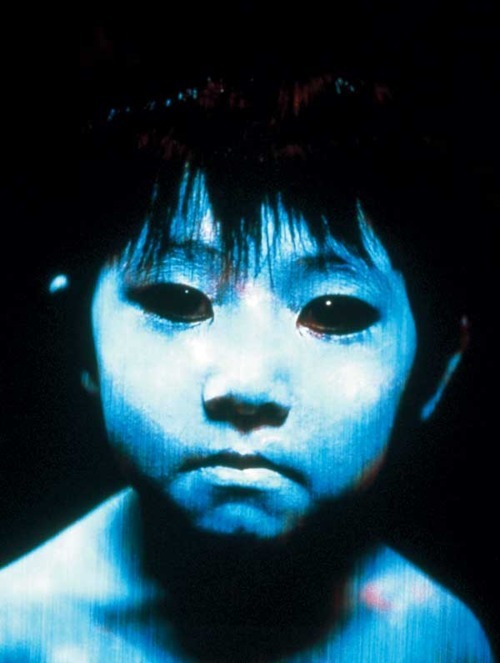 So when the spooky child is used effectively (The best example off the top of my head is Ju-on) two things happen at once. We see a monster and want to run, but when the monster is a distressed child, instincts evolved over millennia draw us to it to offer comfort. These conflicting emotional reactions twist together in our gut like a bayonet. And that’s why creators of horror like to use children.